Note: This is an very invasive species and should not be released into wild waterways. Often misspelt as Ceratophylum demersum. 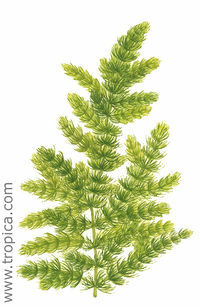 This plant naturally grows in the quiet water of lakes, ponds, marshes, and streams, where it is common, often abundant. These waters are typically neutral or alkaline in their content, and mostly shaded. This makes them excellent choices for low light intensity tanks. Commonly found in plant communities that include species of the genera Elodea (Waterweeds) and Potamogeton (Pondweeds). Foxtail has no roots, instead it is typically anchored to the bottom by pale, modified leaves of root-like appearance. Foxtail is a good pond oxygenator, it usually grows submerged in the water but is sometimes found floating on the surface. Its thin submerged leaves and large surface to weight ratios make it an important habitat species for many aquatic invertebrates. This plant is typically a fully submerged aquatic plant and cannot survive extended surface times. It can be distinguished from other submerged aquatic plants by its stiff, forked leaves in whorls. Mostly found in North America, specifically Nova Scotia to Alaska, south to Florida, Louisiana, Texas, and California into South America. Also Eurasia. This page was last edited on 24 December 2015, at 01:13.